According to recent surveys and analysis, more than 50% of the web population has chrome set as their default and favourite browser. Since we spend most of our time online and we use Chrome for it, it is highly important and essential that we know about the services and features that chrome has in store for us. I am sure that after reading this article your browsing experience and the time spent online will be drastically improved in a positive way! As simple as it may seem to be, most of us do not make use of the functionality the shortcut key combinations offer. Right from making our task easy and saving our time to portray us as a professional in front of others, shortcut keys are a simple and an effective way. The following are some of the most useful shortcut combinations of chrome. The Great Suspender is a yet another addition to the enormous collection of chrome extensions which takes the task of memory management to a whole new level. Many of us have a tendency to open millions of new tabs by right-clicking on whatever interesting content we see on the web and later we forget that they even exist. This maybe because we are glued to some other important work or that we did not have enough time to go through all that stuff. The primary purpose of the great suspender is to avoid it and put you in control of your memory and automatically suspend all those tabs that have been idle or unresponsive for a long period of time. By this process, you can save a large amount of your RAM and prevent your browser from force closing. You can also set customized times before which a tab gets suspended and add your favorite websites to the whitelist to prevent them from getting suspended. Once you decide to visit the tab that has been unused for a long time you can just revoke it from suspension by either reloading it or by just clicking on it based on your preference. In the fast moving world, none of us have the time to sit and write something and even if we rarely set up the mood and find ourselves in writing something, with the hurry and lack of time we may end up typing as quick as possible leading several grammatical and punctuation errors. With Grammarly, a chrome extension and an app for windows OS, you never need to worry about spending the time to correct your errors or insert punctuations at the proper place in a 10-page article you recently wrote. 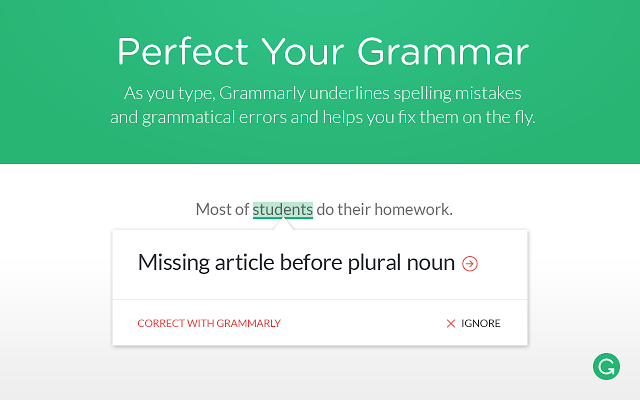 Instead, Grammarly automatically does all these for you along with suggesting you better words to use and correcting your spelling mistakes. It automatically analyses your words and sentences as you type and that display everything that is wrong, including grammar errors, misuse of prepositions, articles and even the usage of vowels at the right place. Though it is free for using, you can purchase the full version and enjoy the additional features like advanced error spotting and vocabulary enhancement. 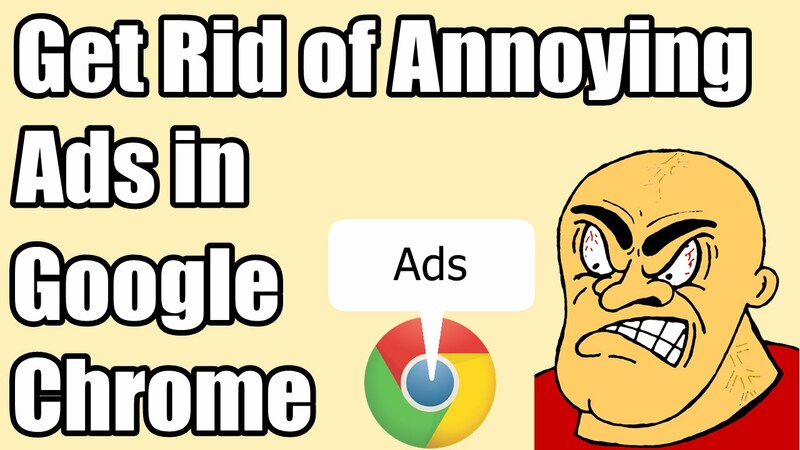 In order to search the web without any distraction we all tend to install some kind of ad block extensions like Adblock Plus but the problem with these kinds of extensions is that they not only occupy a lot of memory in your computer but also makes your browsing experience very bad and lagging. Also, these extensions only block the advertisements that are displayed on a website but they do not do anything about the trackers that are installed on the website and the cookies which are used to check your activity on the web. You can solve these kinds of issues with a single awesome extension called Ghostery which is available in the chrome web store and when you install it in your web browser it not only blocks the advertisements that are displayed on a website but also identifies the various kind of trackers and block them from installing any kind of cookies on your computer. This means that your online activity is protected from trackers and also you can identify which trackers are monitoring you. Thus by using the Ghostery extension your online privacy is highly protected and with the flexibility it provides you can also block all kind of social media plugins and comment and like plugins that are installed on a website and have a hassle free browsing experience. 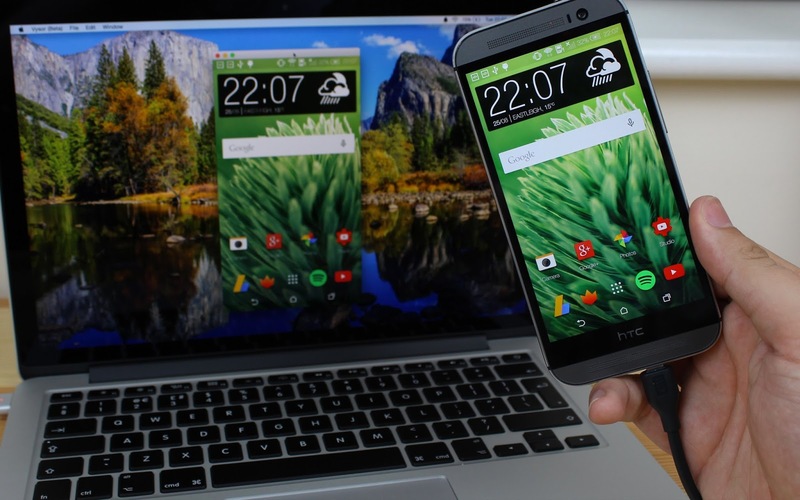 Vysor is a very useful extension for those people who live a multi-screen life and continuously switch between their phone and computer screens to perform various tasks. 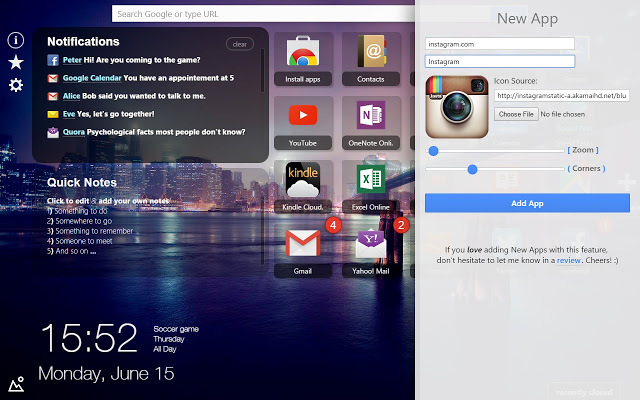 Vysor makes this complex task easier by allowing you to access your smartphone right from your web browser. You can use your PC keyboard to type stuff on your phone and control actions on your phone like opening apps and making calls using your mouse. 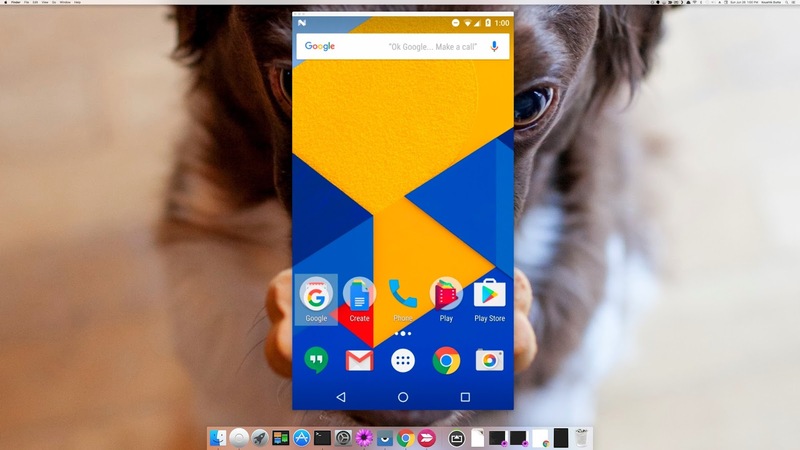 Vysor also displays notifications from your phone and open apps and play games on your computer screen. All you have to do is to install the Vysor app on your phone and install the Vysor extension on your browser and once you create and sign in to your account you are good to go. Join is the only app and extension you need to make your life much easier by avoiding all the constant struggles to handle two devices at the same time. Join can do anything right from sending your phone notifications to your computer, allowing you to reply to messages, play music, transfer files, backup your conversations and even control your phone with your voice from your PC. You can download the app and extension and it will take care of the rest like configuring the server and checking if the connection is enabled properly. You can also send messages to you in the form of notes to your computer from your phone and even copy and paste content seamlessly across your devices. Pocket is a great web extension and an app for people who constantly switch between devices and travel a lot. What it does is that install an icon on your browser extension tab and then save the article you are currently reading and sync it across all the devices you have signed in when you click the button making it easier for you to read it later. With the web filled with media files like photos and videos, it may be frustrating much time to wait for them to load and then open a new tab or an activity for viewing them. Hover Zoom+ solves this issue by allowing you to view all kind of media files like images, video, and even GIF files and sometimes it can even preview the contents behind a supported link if you simply hover your mouse and place it one the content. It saves you a lot of time and data and you can also use the shortcut keys Ctrl+S to save the image while you are previewing it. It may be a pain sometimes to remember all of the websites you visit frequently and type their name in the address bar or search for them in Google owing to the fact that Chrome does not support adding your favorite websites to your new tab for quick access. 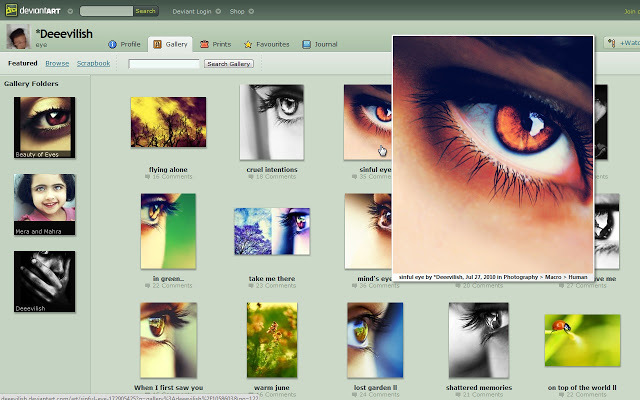 But with the new tab extension known as Home – New Tab Page you can organize your content like never before by adding unlimited tiles containing your favorite websites. It is also highly customizable and supports a lot of themes, background images and comes with a mail and a weather plugin built in. 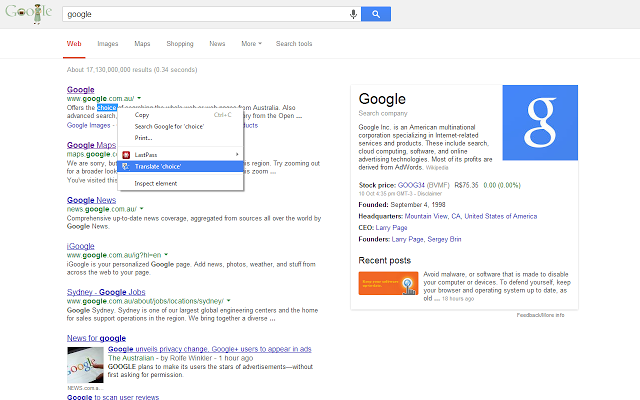 You can also add notes and access your recently closed tabs from this extension. So install it right away and you never need to worry about remembering the long list of websites you visit, anymore. 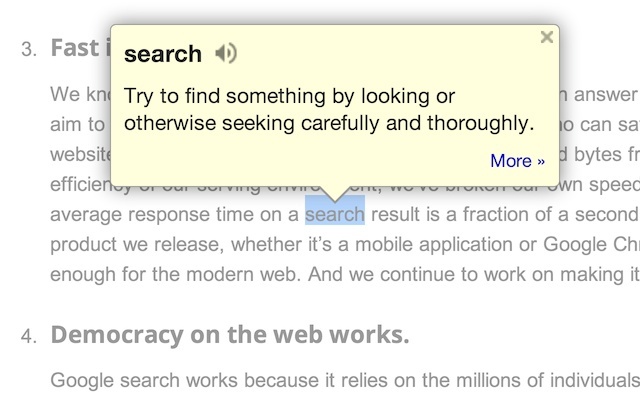 Dictionary, an official extension from Google, instantly displays meaning to any word on a website you visit along with its pronunciation and definition and all you have to do is to double click and highlight the word for which you don’t know the meaning for. Ever land on a page where you thought you would find an important piece of information but went back disappointed just because the website was written in a language unfamiliar to you? You don’t have to miss on important information anymore with Chrome’s inbuilt translate feature which translates any webpage to a language you know and all you have to do is to right-click on an empty area on the website and click on the translate to option. If you have felt at any point of the day that your browser feels sluggish or unresponsive then you should definitely try this option and you don’t need to have any extensions installed on your browser for it to work. All you have to do is to go to your browser settings from the right menu and click on show advanced settings at the end and select the option “use hardware acceleration when available”. With this option turned on, chrome will now make use of the most possible resources available to provide you with a smooth browsing experience. Thank you for reading this post and I hope that you found it useful and informative. Feel free to post your thoughts in the comments below and also post any tricks you know. Like and share if you find it worthy! Previous articleYou can now send GIF files from the keyboard in Whatsapp!